Despite increasing media reporting on China’s economy there is still a fundamental underestimation of the sheer scale of China’s economic growth. It is not generally understood that no economic development on the scale of China has ever taken place previously in the whole of human history. This statement is not an overheated claim by a Chinese nationalist but simply an objectively measurable fact. As will be shown below, even growth in the US, the previous economically dominant state, or in the USSR after 1929, the previous largest example of rapid growth by the standards of a period, was on a qualitatively smaller scale than China. The simplest and clearest gauge of the historically unparalleled scale of China’s economic achievement is the number of people directly benefitting from it as they lived within China’s borders – this being measured not only in absolute numbers but as a proportion of the world’s population. 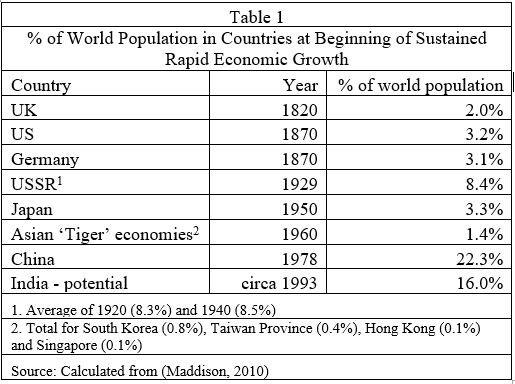 Table 1 therefore shows the percentage of global population in the world’s largest economies at the time they commenced very rapid sustained growth by the historical standards of the periods concerned. The first country to experience sustained rapid economic growth was the UK in the Industrial Revolution, with 2.0% of the world’s population. Sustained rapid US economic growth, after its Civil War, was in a country with 3.2% of the world’s population. When Soviet rapid industrialisation began at the end of the 1920s the USSR contained 8.4% of the world’s population – the international impact of the Soviet Union can be clearly understood by the fact that until 1949 the USSR was by far the biggest impact of industrialisation, in terms of the proportion of the world’s population affected, in history. Almost three times as large a proportion of the world’s population were directly affected by the industrialisation of the USSR as by the rapid economic growth of the US. Japan’s rapid post-World War II growth was in a country with 3.3% of the world’s people. The growth of the four ‘Asian Tigers’ (Hong Kong, Singapore, South Korea, and Taiwan Province) was in economies which together only comprised 1.4% of the world’s population. Additional countries might be included – for example Italy from 1950 (1.9% of the world’s population) or Spain from 1960 (1.0% of the world’s population) – but introducing these makes no significant difference. No other economy commencing sustained rapid economic growth approaches the 22% of the world’s population in China in 1978 at the beginning of its economic reform. China’s, at the time of economic ‘lift-off’, was seven times the relative percentage of the world population of the US or Japan, and almost three times that of the USSR. China’s scale of economic development translated into equally dramatic and unprecedented figures for comparative output increases. Measured at internationally comparable prices (PPPs), and adjusted for inflation, the greatest absolute increase in GDP in a single year ever recorded outside China was by the US in 1999 when it added $567 billion in output. The highest increase in production ever achieved in a single year by Japan, frequently thought of as a post-war ‘miracle’ economy, was $212 billion. The single biggest GDP increase in a single year recorded by South Korea, the largest of the ‘Asian Tiger’ economies, was $90 billion. But in 2010 China added $1,126 billion in output. The increase in China’s GDP in a single year was therefore more than twice that ever achieved by the US and five times that of Japan. This again gives an index of the historically unprecedented scale of China’s development. Calculated from (The Conference Board, 2013) Calculated in EKS PPPs.